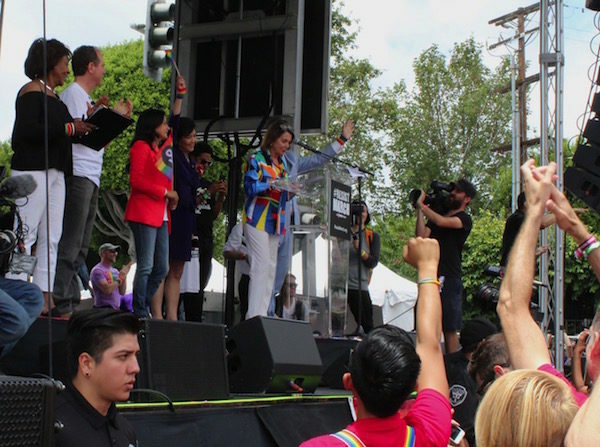 House Minority Leader Nancy Pelosi is the embodiment of the feminist adage “the personal is political.” She celebrated part of her 78th birthday at an LGBT equality weekend in Palm Springs, which she declared a “fabulous” fundraiser for the Democratic effort to “take away” the House from the Republicans in the November midterm elections. Pelosi is so confident of victory, she told the Los Angeles Blade that out Rep. Mark Takano will be the next chair of the House Veterans Affairs Committee come Jan. 2019. Naming names for leadership positions has rankled some Democrats who do not want Pelosi to assume she will be re-elected House Speaker. But with her track record as a strategic political thinker and vote-counter, a prolific fundraiser and one of the most recognizable leaders of the opposition to President Donald Trump and the conservative Republicans who bow his way, Pelosi is frank and assured. After the Affordable Care Act narrowly passed on March 21, 2010, Pelosi noted that women would no longer be charged more because of their gender—women were no longer a pre-existing condition. But the year before, she also predicted “fire and brimstone” and “shock and awe” from across the aisle. “They’re coming after us,” Pelosi told House Democrats in 2009. The strategy around the Equality Act is actually a good example of how Pelosi has worked with changing LGBT leadership over the years. 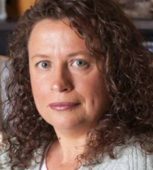 “We moved to Equality Act because we believe the discrimination went well beyond discrimination in the workplace. “Certainly, ENDA [the Employee Non-Discrimination Act] was very important to us as a priority until we realized we need to do more than ENDA—we need to open the Civil Rights Act and to put equality issues in the Act. And this is a big step forward in our opposition to discrimination that permeates our discussion of the workplace, whether it’s people of color, women, the LGBTQ community,” Pelosi says. 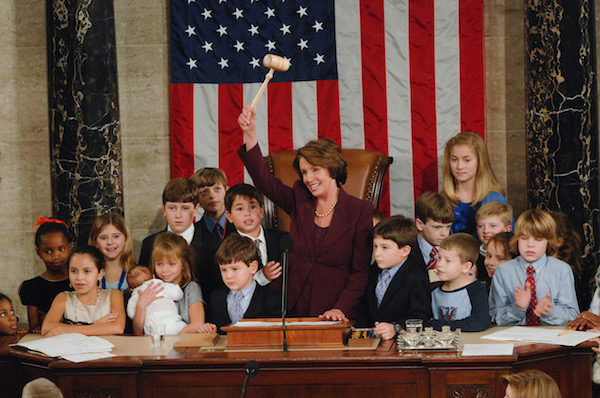 Rep. Nancy Pelosi sworn in as the first female Speaker of the House Jan. 4, 2007. 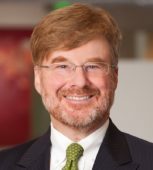 The second LGBT legislative endeavor was supposed to be ENDA, ending discrimination in the workplace. “But the community came forward and said, ‘No, our priority is the repeal of Don’t Ask, Don’t Tell. So do that second. And that we did. The repeal of Don’t Ask, Don’t Tell was a fabulous experience. It was again, expanding freedom,” she recalls. But getting there was not as easy as snapping a finger. 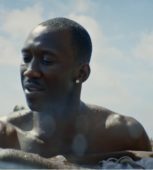 “What was really important about that was that the African American community has been very possessive of the Civil Rights Act. They’re not inclined to open it up because they don’t things to be subtracted from it and in this climate that could happen. But when David Cicilline introduced the bill, many of us were there but standing right next to him was [civil rights icon Rep.] John Lewis, with the imprimatur of the Black Caucus in the Congress.” The late NAACP icon Julian Bond had also been a strong proponent, Pelosi added. One way Pence is accumulating power and influence is by raising money for 2018 Republican candidates, including in California. After Pence popped down to Calexico to take a photo-op on the border, he got down to his real business. “Pence and House Majority Leader Kevin McCarthy of Bakersfield hosted a “roundtable discussion” at a five-star hotel in Beverly Hills, Calif. Monday. For a donation of between $10,000 and $100,000, some of the party’s biggest donors got the chance to schmooze with two of the most powerful Republicans in Washington. 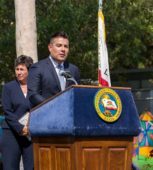 And thanks to a special fundraising mechanism and increasingly lax campaign finance rules, most of that money will get funneled to nearly two dozen vulnerable House colleagues — including California Republican Reps. David Valadao, Jeff Denham and Steve Knight,” the Sacramento Bee reported May 1. From Beverly Hills, Pence headed to Arizona for a rally where he praised racist Senate candidate, Trump-pardoned former Sheriff Joe Arpaio who Pence called “a great friend of this president, a tireless champion of strong borders and the rule of law,” adding, “I’m honored to have you here.” As of April 19, Real Clear Politics shows out bisexual Democrat Rep. Kyrsten Sinema winning over all three Republican primary candidates. That could change if GOP voters consolidate after the primary. 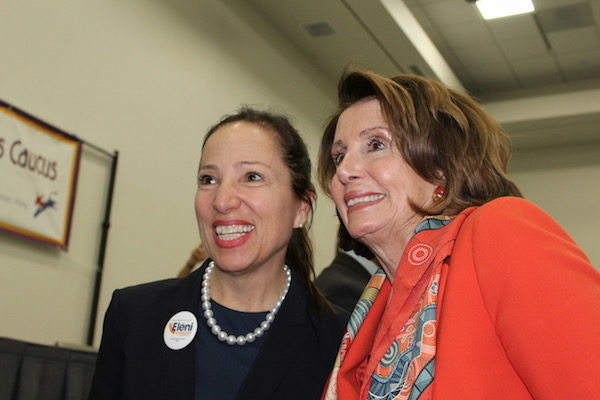 Minority Leader Nancy Pelosi posed with many candidates at the 2018 California Democratic Convention, including Lt. Gov. candidate Eleni Kounalakis. While many of the energized youth are fans of Rep. Maxine Waters’ call for Trump’s impeachment, Pelosi thinks that is not a winning strategy. “Maxine and I go back well before we went to Congress. So count me as a Maxine fan. But I do say focusing on impeachment is a gift to the Republicans,” she says. “What we have to do is focus on the economic insecurity of American families and people. It’s about their apprehensions and their aspirations. And that’s what we need to be talking about. Pelosi is also concerned about Trump getting rid of regulations. “They’re protections,” she says. “If he has an objection to something, let’s discuss that, make it better or not, if we think it’s the best it can be.” But it’s critical to recognize that “he is destroying the protections for clean air, clean water, food safety, consumer protections,” and the other protections, including the rollback of protections for LGBT people. 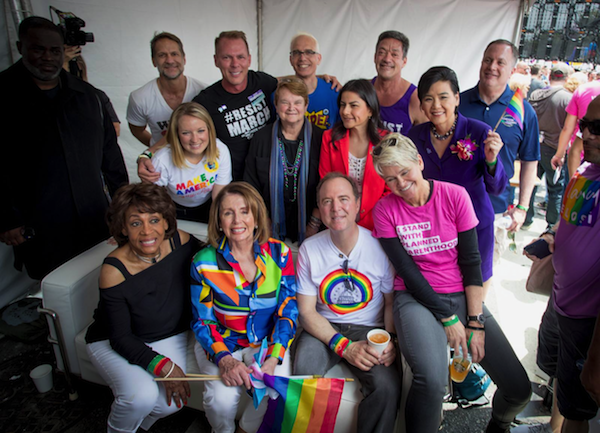 While young people at the #ResistMarch in West Hollywood last year were stirred up by Leader Pelosi’s rhetoric, it was clear they knew she was important—but not really who she was and why she was so passionate about LGBT equality. 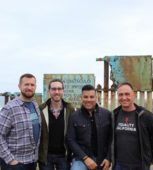 Ironically, because San Francisco “took a very big bite of that wormy apple called AIDS,” the Church “was more sympathetic to people when they had HIV/AIDS because they needed help then they were to people who weren’t infected. It was the strangest, strangest thing,” Pelosi says. Pelosi is also guided by a moral imperative that young people may not understand today—the deep, personal impact of AIDS. 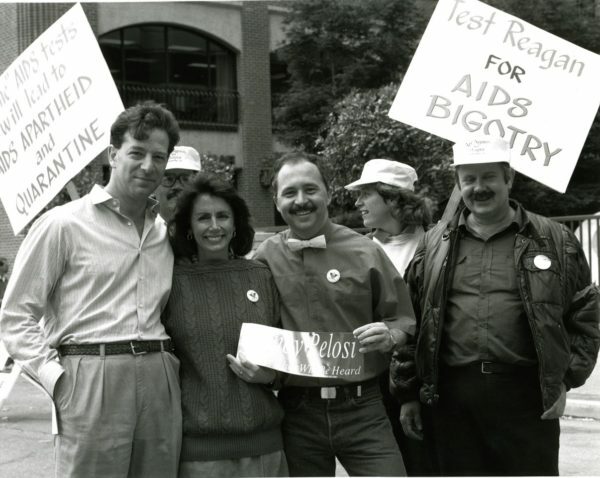 “Some people criticized me for talking about AIDS on my first day in Congress and I realized that it was not just about getting funding for AIDS research and prevention and care but it was about ending discrimination against people with HIV and AIDS,” adding that California has been a “tremendous resource” throughout the years for intellectual, political and economic response to the disease. 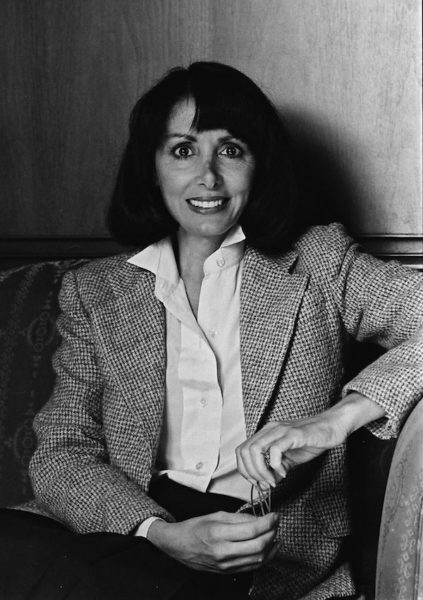 Within the span of her life and political career, Pelosi has personally experienced the heartbreak of HIV/AIDS and the political battles to fund and find a cure. It appears that the quality of simultaneously never forgetting while always looking forward is a key motivating factor for House Minority Leader Nancy Pelosi. This article is an expanded version of the cover story for the commemorative first weekly print edition of the Los Angeles Blade. It is the featured story for the Washington Blade, as well.